Baking gluten-free? For great results, substitute King Arthur Gluten-Free Measure for Measure Flour for the all-purpose flour in this recipe; no other changes are needed. Preheat your oven to 425°F with a rack in the upper portion. Get out a baking sheet; there's no need to grease it. Line it with parchment if you like, for easiest cleanup. Weigh your flour; you'll find its weight by toggling to ounces or grams at the top of the ingredient section above. Or measure it by gently spooning it into a cup, then sweeping off any excess. Work the butter into the flour mixture using your fingers, a fork or pastry blender, a stand mixer, or a food processor; your goal is an evenly crumbly mixture (think breadcrumbs). Drizzle the smaller amount of milk evenly over the flour mixture. Mix quickly and gently for about 15 seconds, until you've made a cohesive dough. If the mixture seems dry and won't come together, don't keep working it; drizzle in enough milk — up to an additional 2 tablespoons (1 ounce) to make it cohesive. Place the dough on a lightly floured work surface. Pat it into a rough rectangle about 3/4" thick. Fold it into thirds like a letter and roll gently with a floured rolling pin until the dough is 3/4" thick again. Cut the dough into circles with a biscuit cutter for traditional round biscuits; a 2 3/8" cutter makes nice-sized biscuits. 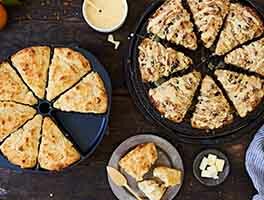 Or to avoid leftover dough scraps, cut the dough into squares or diamonds with a bench knife or sharp knife. Place the biscuits bottom side up on your prepared baking sheet; turning them over like this yields biscuits with nice, smooth tops. Brush the biscuits with milk, to enhance browning. Bake the biscuits for 15 to 20 minutes, until they're lightly browned. Remove them from the oven, and serve warm. 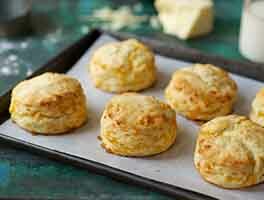 Store any leftover biscuits, well wrapped, at room temperature for several days. Freeze for longer storage. Biscuits are always best when they're rewarmed before serving. Substitute buttermilk, light cream, or heavy cream for the whole milk, if you prefer. Use enough of whatever liquid you choose to bring the dough together readily, without having to work it too much. For more tips on how to substitute different liquids and fats in biscuits, see our blog post, Fats and liquids in biscuits. 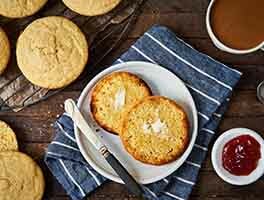 If you're going to use the biscuits for shortcakes, increase the sugar to 2 tablespoons, and stir 1 teaspoon vanilla into the dry mixture along with the milk. Also, dissolve a teaspoon of sugar in the tablespoon or so of milk you use to brush the tops; this will help them brown nicely and impart mild sweetness to the crust. If you have time, prepare the biscuits up to the point they're on the pan before preheating your oven. Place the pan of biscuits in the refrigerator while you preheat your oven to 425°F, or for about 20 to 30 minutes. This short chill will help them maintain their shape while baking. Placing cut biscuits closer together (with 1/4" of space between them) will help them rise higher and straighter; they'll literally hold each other up as they rise in the oven. The sides will be softer, also. If you like a crisp biscuit, space them at least 1" apart on the baking sheet so the oven's heat can reach their sides. My biscuits didn't rise What did I do wrong? 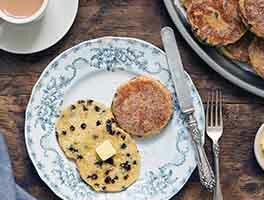 I have numerous recipes for Biscuits, some using milk, very few using buttermilk. That is what caught my eye. I made these quickly for dinner last night, and we were not disappointed! Light, flavorful, layers of goodness. I couldn't stop eating them. Great recipe, easy too. Mix up a batch in no time. Wonderful. 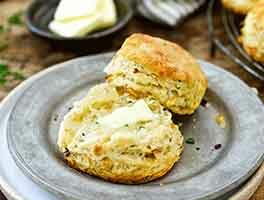 My kids live down south, so having southern biscuits you tend to keep looking for a comparable recipe. Well,I found it! Fabulous. My kids hate cereal, absolutely hate it. I make a lot of different biscuits/rolls for dinner times but I was looking for something light and simple for breakfast time. These were a huge hit; heated up a bit with some butter. Making a batch on a Sunday night for weekday breakfasts is a cinch! 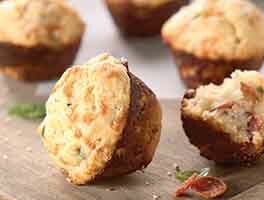 I've made these a number of times and if you follow the recipe, they are spot on! Wonderful! I've followed KAF for a long time, and you folks know what you are doing! Keep it up . Thanks for sharing these recipes. Anne from Manitoba add 1/4 teaspoon of baking soda in the dry ingredient, it will help rise the biscuit :). I'm a vegan. I made these using your whole grain flour and by substituting unsweetened applesauce instead of butter and full fat coconut milk instead of dairy. They are delicious! HEY WHAT IS 1/8 OF A CUP OF MILK? This is a standard and basic biscuit. It is very okay. If you have ever had an amazing biscuit, or you have been in biscuit nirvana this will not get you there. I will keep looking.